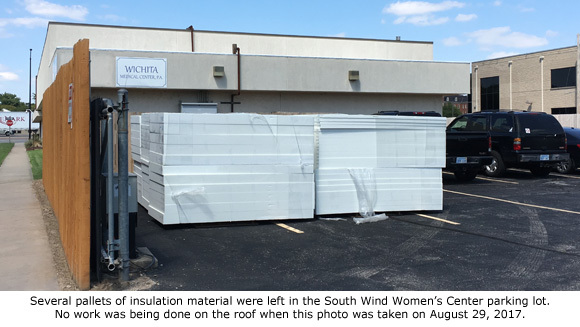 Wichita, Kansas – A contractor has walked off a roofing job at South Wind Women’s Center, an abortion facility in Wichita, Kansas, leaving the installation of a new roof only half completed after it learned it had been deceived into thinking it was working on a real estate business. 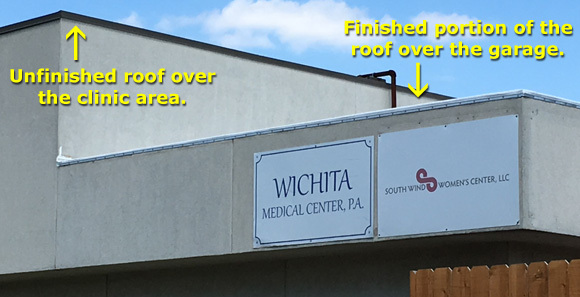 South Wind’s owner and administrator, Julie Burkhart, sought the services of Farha Roofing under the guise of Kellogg, LLC, while concealing the fact the building was actually an abortion facility. It was only after Farha Roofing began the job on the leaky, flat-roofed building that they found out the true nature of Burkhart’s business, thanks to Mark Gietzen and the Kansas Coalition for Life (KCFL). “Farha Roofing was slow to comply with our request, but they eventually pulled off the job, leaving it half-done, and have not been back since,” Gietzen said yesterday in a written statement. He thanked all pro-life supporters who called the company to complain. White-edged portions of the roof were the only parts completed, including the area over the garage. However, the clinic portion of the roof still showed the original brown trim, indicating that none of the patient-used portion of the building had been re-roofed. The roofing contractor left what appeared to be foam insulation material stacked on pallets in the parking lot. It may be a long time before any more work is done. South Wind has had difficulty finding anyone in Wichita to work on their building and have had to go out of town — and even out of state — for some venders, such as plumbers and electricians. “The message is loud and clear. The people of Wichita do not want an abortion facility operating in their city,” said Troy Newman, President of Operation Rescue, which is based in Wichita and often partners with the KCFL. Gietzen plans to send letters to all area businesses warning them of Burkhart’s use of deception to trick contractors into servicing her South Wind Women’s Center abortion facility. Woman heard screaming in agony after perforated uterus during botched abortion. Planned Parenthood is dishing out abortion drugs to women using an smart phone app & the US Mail. Population Control agenda is behind this new scheme! Hemorrhaging woman calls 911 for herself after abortion clinic kicks her to the curb at closing time. Heartbreaking 911 call. Mother finds daughter dead after abortion.